CableMover has now changed its name to SmartMove.us. The review below is no longer valid. If you’re looking for deals on cable then check out some of the deals on our website from places like Verizon Fios to others such Comcast Xfinity, Charter Spectrum and more. Paying for cable and internet is usually one of the monthly expenses for most that just seems to keep getting more expensive. 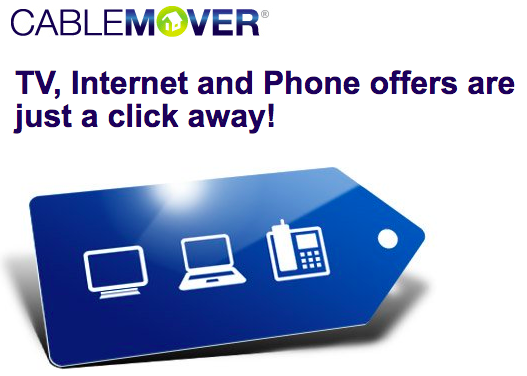 CableMover is a service that we’ve partnered with that can help you save on your cable, internet, and home phone whether you’re moving or possibly switching to another provider. Their service connects you with deals for top providers across the United States. You can find all of the providers below and a review of their services below. Cable and Internet Providers With Deals: CableMover partners with top providers including Comcast Xfinity, Charter Spectrum, Cox, Optimum, Suddenlink, Mediacom, Cable One, Atlantic Broadband, Armstrong, MetroCast, BendBroadband, MCTV and more. Is CableMover Legit Or A Scam? One question we get frequently is whether CableMover is legit or a scam. The answer is, of course, it’s legit and is actually part of CTAM (Cable & Telecommunications Association for Marketing) which is leading telecom companies such as Comcast, Altice, Cox, Charter and more. The organization runs CableMover.com along with other websites, direct mail, and the Cable Mover Hotline. How Much Can CableMover Save You? The exact amount that CableMover can save you will depend on your current provider, where you’re located, and what provider you’re wanting to switch to. There will be some cases where you have a very low price on your bundle of services and they can’t save you much to others who could potentially save thousands per year. Those who will save the most compared to their old provider will be those who probably have had the same provider for a long time or haven’t properly bundled their services. You can always get a quick quote from CableMover on their website to see if you’re eligible for any type of savings You will just need to fill out your address, phone number, and email address to receive your savings quote. If you’re switching providers then you should be eligible for introductory pricing which will be much lower than what most are paying, but it can go up in price once that period is over. KEEP GETTING POP UP FROM THIS COMPANY ON MY HOME SCREEN…NO VALID PHONE NUMBER FOR THIS FAKE COMPANY. No LIVE SUPPORT TO GET RID OF THEIR POP UP.